For the former stadium that once stood on the same site, see Former National Stadium, Singapore. The National Stadium is a multi-purpose stadium located in Kallang, Singapore. It opened its doors on 30 June 2014, replacing the former National Stadium at the same site, which was closed in 2007 and demolished in 2010. The stadium features a domed roof structure with a retractable roof and configurable seating on the lowest tier to make it the only stadium in the world that is custom designed to host football, rugby, cricket and athletics events. It is also the world's largest retractable dome.The lowest tier has mechanised and automated retractable seating configurations, allowing the stadium to host concerts and other entertainment purposes at any given time. It takes approximately 48 hours to reconfigure seating arrangements to suit an upcoming event. Depending on the seating configurations, the stadium has either a maximum seating capacity of 55,000 for football and rugby, 52,000 for cricket or 50,000 spectators for athletics events/concerts. The stadium is a part of the large multi-purpose Singapore Sports Hub complex which comprises the OCBC Aquatic Centre, the multi-purpose OCBC Arena, the Singapore Sports Museum, the Sports Hub library, the Kallang Wave Mall shopping mall and the current Singapore Indoor Stadium; as well as a Water Sports Centre at the adjacent Kallang Basin. The stadium is also home to the Singapore national football team for their international football matches, making a return here for the first time after four years at the Jalan Besar Stadium since the demolition of the old stadium in 2010. The special roof is made out of insulated metal to reflect sunlight. For the first time since 2006, the Singapore National Day Parade made its return to Kallang on 9 August 2016. Besides the National Day Parade, it is also one of the alternating host venues of the Passing-Out-Parade ceremony for Singapore Armed Forces recruits graduating from the Basic Military Training Centre since September 2015; the other venue being The Float at Marina Bay first held there in October 2010, which is also a venue for the National Day Parade from 2007 to 2009 and 2011 to 2014. Construction work for the sports hub started in 2010 due to the delays caused by the 2008 financial crisis and soaring construction costs. By September 2011, the pilling and the foundation of the stadium was completed and construction on the steelworks of the stadium fixed roof started. On July 2013, the installation of the stadium final primary steel 'runway truss' for the roof was completed marking the completion of the steelworks on the National Stadium's fixed roof in preparation for installation of the retractable roof. The stadium was set to be completed in April 2014, however, In February 2014, Sports Hub CEO Philippe Collin Delavaud announced that the National Stadium's completion was pushed back to June 2014. The stadium has configurable spectator tiers depending on the event that will be hosted, namely "Football/Rugby mode", "Cricket mode" and "Athletics mode". To reconfigure from the athletics mode to the football/rugby mode, the lowest spectator tier can be moved 12.5 meters forward, obscuring the athletics running track underneath the seats and thus bringing spectators close to the pitch to provide optimum spectator viewing distances. An energy efficient cooling system is also designed to deliver cooled air to every seat in the stadium while using less than 15 percent of energy as compared to a conventional air-conditioned stadium, providing every spectator a cool and comfortable time to enjoy an event. The National Stadium currently holds the record of the largest dome structure in the world. The retractable roof itself will take an approximate 25 minutes to open or close. The roof is made out of a lightweight material called ETFE, which is weather-resistant and blocks the sun's heat, giving shade and protecting spectators from the hot and humid Singapore weather and potential torrential rain. At night, the retractable roof doubles as a giant projector screen on both sides, which can display images such as the Singapore Flag during the National Day Parade. Desso GrassMaster was installed as the original grass pitch when the stadium opened. The sandy pitch was criticised by Juventus manager Massimiliano Allegri during a pre-season friendly there in August 2014 and resulted in his decision not to field Carlos Tevez due to injury concerns. Afterwards, S$1.5 million of special growth lights were installed to stimulate and speed up the growth of the grass, with one of the main concerns being getting the pitch ready for the 2014 Suzuki Cup at the end of the year. In October 2014, Brazil coach Dunga criticised the state of the pitch, which had not improved much since the Juventus match, when his side were in Singapore to play a friendly against Japan. Although Brazil won the match 4–0, he said after the match that the sandy pitch had prevented his side from playing their best football. Eventually, the grass still failed to grow well and was replaced by the Eclipse Stabilised Turf in May 2015. The stadium is located above the underground Stadium MRT station on the Circle Line. Trains arrive every five to six minutes during off-peak hours, and two to three minutes during peak hours and event days. Other MRT stations nearby are Kallang MRT station which can be accessed using a sheltered walkway, and Mountbatten MRT station. Both of these stations are within 600 metres (2,000 ft) of the stadium. The upcoming Tanjong Rhu MRT station will complement the existing stations once completed in 2023. Bus stops are located around the Sports Hub complex along Stadium Walk, Stadium Boulevard and Nicoll Highway, with buses serving nearby districts and the city. Taxi stands are also conveniently available near the National Stadium, Singapore Indoor Stadium and Leisure Park Kallang. Sports Hub was meant to replace the Old National Stadium as a premium location for high spectator capacity Singapore sports, large scale national events and top entertainment acts, but its operation was marked by several controversies. The quality of the field pitch was put under scrutiny after the football match between Juventus and Singapore in August 2014, and again in October 2014 during the Brazil vs Japan friendly. The initial Desso GrassMaster system made of synthetic fibres and natural grass was widely criticised for its sandy nature and was replaced by the lay-and-play natural pitch in 2015. Plans to hold major sports events at the stadium were scrapped due to the high costs of rental. Talks to hold The Merlion Cup football quadrangular and the Asia Masters Athletics Championships did not go through and the discussion to hold the 2016 NDP were stalled for a month due to cost issues as well. The old National Stadium was demolished to make way for the Sports Hub, which was seen as a possible new location for future National Day parades (NDP) in Singapore. The venue hosted the NDP in 2016, two years after opening. However, the new stadium is considered unsuitable as the Singapore Armed Forces Parachute Team is unable to parachute into the domed stadium due to safety concerns. The dome structure also obstructs the view from outside, making the traditional military flypast and outdoor fireworks hard to observe for the stadium spectators. Heavy armoured military vehicles also cannot drive past spectators as the stadium tracks are not designed to accommodate them. It is also three times more expensive for the government to hold national day parade at the new stadium compared to the temporary floating platform, Float@Marina Bay, despite being a public-private partnership. Under the contract between the Sports Hub and Singapore Government, NDP organisers were allowed 45 days of free annual usage of the venue. However, technicians and performers reported that the time frame needed to be extended to 80 days, to which the Sports Hub requested an additional $10 million. In the end the total cost of running the event (rental) in 2016 was S$39.4 million. In October 2017, Prime Minister Lee Hsien Loong announced that the Marina Bay Floating Platform will be used as the primary venue for future NDPs. The National Stadium hosted the opening ceremony and other events during the 2015 Southeast Asian Games. Other sports events included the World Club 10s Rugby in June 2014, a friendly match between Juventus and a Singapore Selection side in August 2014, which was the first-ever football match at the new stadium. The friendly match between Brazil and Japan in October 2014 is the first-ever sell-out crowd of 55,000 at the stadium. It also hosted the 2014 AFF Suzuki Cup in November 2014. It is the venue of all the matches of the 2015 Barclays Asia Trophy that is held in Singapore. The stadium was the venue for the 2016 National Day Parade. From June 2014 onwards, the stadium will also host cricket with day-night One-Day Internationals and Twenty20 Internationals matches. There is a prospect of international cricket fixtures and is the possibility of the International Cricket Council moving its headquarters from Dubai to Singapore. Concerts from international artists are highlighted in light blue. ^ "Construction commences on Singapore Sports Hub". Arup. 25 March 2011. Archived from the original on 18 July 2013. Retrieved 14 October 2013. ^ "Singapore's National Stadium fixed roof steelwork complete". Arup. 19 July 2013. Archived from the original on 20 September 2013. Retrieved 14 October 2013. ^ "Foundation laid for new National Stadium". Red Sports. 16 September 2011. Archived from the original on 14 October 2013. Retrieved 14 October 2013. ^ "National Stadium to miss April opening". Channel NewsAsia. 14 February 2014. Archived from the original on 14 February 2014. Retrieved 14 February 2014. ^ "World Class Facilities". Singapore Sports Hub. Archived from the original on 17 October 2013. Retrieved 14 October 2013. ^ "Positive moves in boosting popularity of cricket". Archived from the original on 29 August 2013. Retrieved 29 August 2013. ^ "Singapore Sports Hub". Arup. Archived from the original on 20 September 2013. Retrieved 14 October 2013. ^ "World's largest dome roof taking shape in Singapore". Gizmag. 29 October 2012. Archived from the original on 5 November 2013. Retrieved 14 October 2013. ^ "Singapore's new National Stadium to have world's largest dome". The Jakarta Post. 5 October 2012. Archived from the original on 15 June 2013. Retrieved 14 October 2013. ^ "Sports Hub to use Desso GrassMaster for its National Stadium pitch". Channel NewsAsia. 21 May 2014. Archived from the original on 21 May 2014. Retrieved 21 May 2014. ^ "National Stadium pitch under fire". TODAYonline. 19 August 2014. Archived from the original on 16 March 2016. Retrieved 8 July 2015. ^ "Controversy over condition of National Stadium pitch rumbles on". Goal.com. 16 October 2014. Archived from the original on 24 September 2015. Retrieved 9 July 2015. 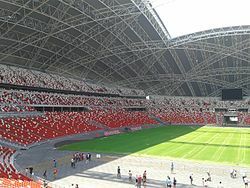 ^ "Singapore Sports Hub unveils new National Stadium pitch ahead of SEA Games". Channel NewsAsia. 19 May 2015. Archived from the original on 4 March 2016. Retrieved 9 July 2015. ^ a b Nair, Sanjay (24 January 2016). "Sports Hub drops claims over $900k damage to National Stadium pitch". The Straits Times. Archived from the original on 27 December 2017. Retrieved 26 December 2017. ^ U-Wen, Lee (4 December 2017). "Sports Hub a massive project that 'cannot fail': Oon Jin Teik". The Business Times. Archived from the original on 26 December 2017. Retrieved 26 December 2017. ^ "Man in charge of controversial SportsHub pitch resigns". Today. 6 December 2014. Archived from the original on 26 December 2017. Retrieved 26 December 2017. ^ Low, Lin Fhoong (12 November 2016). "National Stadium pitch to get yet another makeover". Today. Archived from the original on 26 December 2017. Retrieved 26 December 2017. ^ Low, Lin Fhoong (17 December 2015). "High costs 'a new reality' with new National Stadium". Today. Archived from the original on 26 December 2017. Retrieved 26 December 2017. ^ Nair, Sanjay (13 December 2015). "Is the Sports Hub pricing itself out of the game?". Archived from the original on 27 December 2017. Retrieved 26 December 2017. ^ a b c Tan, Weizhen (10 August 2016). "NDP 2016: Show a treat, but new venue gets mixed reviews". Today. Archived from the original on 26 December 2017. Retrieved 26 December 2017. ^ "Futuristic concept for NDP 2016". The Straits Times. 10 March 2016. Archived from the original on 27 December 2017. Retrieved 26 December 2017. ^ "What price for NDP at Sports Hub?". The Straits Times. 23 June 2016. Archived from the original on 27 December 2017. Retrieved 26 December 2017. ^ Low, Lin Fhoong (10 December 2015). "Talks to hold NDP 2016 at Sports Hub at an impasse". Today. Archived from the original on 26 December 2017. Retrieved 26 December 2017. ^ Chow, Jermyn (29 February 2016). "Parliament: NDP 2016 at National Stadium to cost $39.4m". The Straits Times. Archived from the original on 27 December 2017. Retrieved 26 December 2017. ^ Low, Lin Fhoong (31 October 2017). "NDP loss a setback for National Stadium's bid to become a S'pore icon". Today. Archived from the original on 26 December 2017. Retrieved 26 December 2017. ^ "Singapore's new National Stadium sells out Japan-Brazil clash". Archived from the original on 22 October 2014. Retrieved 14 October 2014. ^ "SINGAPORE'S SPORTS HUB IMPRESSES". Archived from the original on 7 September 2013. Retrieved 29 August 2013. ^ "5 JUL 2014 KEPLER WORLD TOUR Stefanie Sun 2014 Kepler World Tour". Singapore Sports Hub. Archived from the original on 18 November 2016. Retrieved 20 November 2016. ^ "Stefanie Sun to perform at new National Stadium in July". 2 April 2014. Archived from the original on 19 November 2016. Retrieved 20 November 2016. ^ Lay, Belmont (25 June 2014). "This is what happened to local singer Stefanie Sun after performing 30 songs at Chongqing concert". Archived from the original on 18 November 2016. Retrieved 20 November 2016. ^ Toh, Chrisopher (6 July 2014). "Stefanie Sun 2014 Kepler World Tour". TODAY Online. Archived from the original on 18 November 2016. Retrieved 20 November 2016. ^ "24 OCT Mariah 'The Elusive Chanteuse Show'". Singapore Sports Hub. Archived from the original on 18 November 2016. Retrieved 20 November 2016. ^ Wong, Laetitia (29 July 2014). "Mariah Carey back in Singapore". TODAY Online. Archived from the original on 18 November 2016. Retrieved 20 November 2016. ^ "Mariah Carey To Perform in Singapore on October 24 at the National Stadium". Archived from the original on 29 July 2014. Retrieved 29 July 2014. ^ Raguraman, Anjali (29 July 2014). "Mariah Carey to serenade Singapore at new National Stadium". insing.com. Archived from the original on 18 November 2016. Retrieved 20 November 2016. ^ Ann Zachariah, Natasha (25 October 2014). "Concert review: Mariah Carey finds her voice in Singapore, after all". The Straits Times. Archived from the original on 2 June 2016. Retrieved 20 November 2016. ^ "Mariah Carey hits all the right notes at Singapore concert". AsiaOne. 20 November 2014. Archived from the original on 19 November 2016. Retrieved 20 November 2016. ^ "27 DEC OPUS 2 JAY 2014 WORLD TOUR POSTPONED To 27 DECEMBER 2014, 8PM". Singapore Indoor Stadium. Archived from the original on 18 November 2016. Retrieved 18 November 2016. ^ Jing Yi, Hon (28 December 2014). "Concert Review: Jay Chou Opus 2 World Tour". TODAY Online. Archived from the original on 18 November 2016. Retrieved 20 November 2016. ^ Ng, Gwendolyn (17 October 2014). "Some Jay Chou fans lament at later concert date, say they have made travel plans". The Straits Times. Archived from the original on 18 November 2016. Retrieved 20 November 2016. ^ Xu, Terry (28 December 2014). "Jay chou's concert met with complaints from fans about the venue provider". The Online Citizens. Archived from the original on 18 November 2016. Retrieved 20 November 2016. ^ "ONE DIRECTION 'ON THE ROAD AGAIN' TOUR 2015". Singapore Sports Hub. Archived from the original on 18 November 2016. Retrieved 22 November 2016. ^ "ONE DIRECTION on Their Road Again Tour Singapore". superadrianme.com. Archived from the original on 17 October 2015. Retrieved 22 November 2016. ^ "One Direction to play in Singapore in March 2015". insing.com. Archived from the original on 15 February 2017. Retrieved 22 November 2016. ^ "One Direction: Milestones, concerts and Singapore fans". The Straits Times. 11 March 2015. Archived from the original on 18 November 2016. Retrieved 22 November 2016. ^ Toh, Christopher (12 March 2015). "Concert review: One Direction". TODAY Online. Archived from the original on 18 November 2016. Retrieved 22 November 2016. ^ "Reliving One Direction's Singapore concert". TODAY Online. 12 March 2015. Archived from the original on 18 November 2016. Retrieved 22 November 2016. ^ Roth, Madeline (12 March 2015). "WOAH…ONE DIRECTION'S SINGAPORE CONCERT BROKE A HUGE RECORD". MTV. Archived from the original on 18 November 2016. Retrieved 22 November 2016. ^ "Billboard Boxscore : Current Scores". Billboard. 1 April 2015. Archived from the original on 1 April 2015. ^ "9 JAN AMEI – AMIT UTOPIA WORLD TOUR 张惠妹乌托邦世界巡城演唱会". Singapore Sports Hub. Archived from the original on 11 November 2016. Retrieved 22 November 2016. ^ "AMei to perform in Singapore on Jan 9". AsiaOne. 9 September 2015. Archived from the original on 19 November 2016. Retrieved 22 November 2016. ^ Hong, Jing Yi (10 January 2016). "Concert review: aMEI/AMIT UTOPIA World Tour". TODAY Online. Archived from the original on 18 November 2016. Retrieved 22 November 2016. ^ "MADONNA REBEL HEART TOUR 2016 – SINGAPORE Rated R18 (Sexual References)". Singapore Sports Hub. Archived from the original on 21 November 2016. Retrieved 22 November 2016. ^ Sherwell, Philip (23 February 2016). "Singapore's archbishop urges boycott of 'blasphemous' Madonna". The Telegraph. Archived from the original on 18 November 2016. Retrieved 22 November 2016. ^ Chong, Alvin (28 February 2016). "Madonna's Rebel Heart tamed in Singapore". Channel NewsAsia. Archived from the original on 1 March 2016. Retrieved 22 November 2016. ^ Abdul Hadi, Eddino (28 February 2016). "Madonna works the crowd at her Rebel Heart concert in Singapore". The Straits Times. Archived from the original on 18 November 2016. Retrieved 22 November 2016. ^ Raguraman, Anjali (29 February 2016). "Some fans elated, others disappointed with Madonna's first concert in Singapore". The Straits Times. Archived from the original on 18 November 2016. Retrieved 22 November 2016. ^ Abdul Hadi, Eddino (29 February 2016). "Concert Review: Madonna softens her 'rebel heart' for Singapore show". The Straits Times. Archived from the original on 18 November 2016. Retrieved 22 November 2016. ^ ""THE INVINCIBLE" JAY CHOU CONCERT TOUR 2016 "地表最强"2016周杰伦世界巡回演唱会". Singapore Sports Hub. Archived from the original on 21 November 2016. Retrieved 22 November 2016. ^ "30,000 tickets to Jay Chou's Singapore concert sold in 2 hours". AsiaOne. Archived from the original on 18 November 2016. Retrieved 22 November 2016. ^ Tan, Audrey (9 September 2016). "22-year-old man arrested in connection with Jay Chou ticket scam". The Straits Times. Archived from the original on 18 November 2016. Retrieved 22 November 2016. ^ Loh, Genevieve (9 September 2016). "22-year-old arrested for selling fake tickets to Jay Chou concert". Channel NewsAsia. Archived from the original on 18 November 2016. Retrieved 22 November 2016. ^ Tan, Emilia (2 September 2016). "Jay Chou in Singapore, says Nathan Hartono won't be performing at his concert". TODAY Online. Archived from the original on 18 November 2016. Retrieved 22 November 2016. ^ Twang, Lisa (4 September 2016). "Jay Chou concert tour: Less than invincible Chou". AsiaOne. Archived from the original on 19 October 2016. Retrieved 22 November 2016. ^ Chan, Boon (5 September 2016). "Jay Chou concert tour: Less than invincible Chou". The Straits Times. Archived from the original on 18 November 2016. Retrieved 22 November 2016. ^ Lay, Belmont (5 September 2016). "Angry Jay Chou fans petition for refund as lousy sound plagues concert at S'pore Sports Hub again". mothership.sg. Archived from the original on 18 November 2016. Retrieved 22 November 2016. ^ Chan, Boon (7 September 2016). "Jay Chou fans want refund over poor concert sound". The Straits Times. Archived from the original on 18 November 2016. Retrieved 22 November 2016. ^ Leow, Diane (6 September 2016). "Speakers moved at Jay Chou concert to minimise obstruction of view: Organisers". Channel NewsAsia. Archived from the original on 18 November 2016. Retrieved 20 November 2016. ^ "COLDPLAY – A HEAD FULL OF DREAMS TOUR". Singapore Sports Hub. Archived from the original on 21 November 2016. Retrieved 22 November 2016. ^ Abdul Hadi, Eddino (15 November 2016). "It's no joke, Coldplay to play their 4th Singapore show at National Stadium on April 1". The Straits Times. Archived from the original on 7 November 2017. Retrieved 22 November 2016. ^ "Coldplay coming to Singapore next April". Channel NewsAsia. 15 November 2016. Archived from the original on 15 November 2016. Retrieved 22 November 2016. ^ "Tickets for Coldplay concert in Singapore to go on sale on Nov 21 from $78". AsiaOne. 15 November 2016. Archived from the original on 18 November 2016. Retrieved 22 November 2016. ^ Peters, Daniel (17 November 2016). "Coldplay's Citibank pre-sale has already sold out, Singapore fans panic". Bandwagon. Archived from the original on 18 November 2016. Retrieved 22 November 2016. ^ Bhattacharjya, Samhati (18 November 2016). "Coldplay Singapore concert: Fresh 28,000 tickets available after record sell-off on day 1". International Business Times. Archived from the original on 22 November 2016. Retrieved 22 November 2016. ^ Lay, Belmont (18 November 2016). "Coldplay S'pore concert organiser looking to bar those who bought resale tickets". mothership.sg. Archived from the original on 22 November 2016. Retrieved 22 November 2016. ^ Ray, Bihu (21 November 2016). "Coldplay Singapore tickets sold out in 2 hours; but some 10,000 tickets may yet be issued". International Business Times. Archived from the original on 22 November 2016. Retrieved 22 November 2016. ^ Lay, Belmont (21 November 2016). "All 40,000 Coldplay S'pore concert tickets sold out". mothership.sg. Archived from the original on 22 November 2016. Retrieved 23 November 2016. ^ Abdul Hadi, Eddino (22 November 2016). "Coldplay aware of the ticket tout problems here, extra tickets may be released by Thursday". The Straits Times. Archived from the original on 7 November 2017. Retrieved 23 November 2016. ^ Raguraman, Anjali (16 May 2017). "Foo Fighters back for Singapore concert on Aug 26, 20 years after they last played here". The Straits Times. Archived from the original on 19 June 2017. Retrieved 18 July 2017. ^ Jan, Lee (10 October 2018). "K-pop sensation BTS to hold concert in Singapore next year". The Straits Times. Archived from the original on 10 October 2018. Retrieved 10 October 2018. Wikimedia Commons has media related to National Stadium, Singapore.